Digital technologies will help procurement increase collaboration, analytics, and engagement using a spectrum of tools along the entire procurement value chain, from planning and sourcing to contract negotiations, order delivery, payment, and supplier management. A system of physical things embedded with sensors, software, electronics, and connectivity to allow it to perform better can be defined as The Internet of Things or IoT. 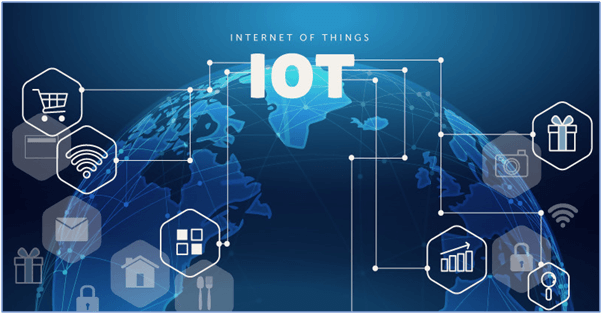 By exchanging information with other connected devices, the operator or the manufacturer IoT signifies the importance of IoT Application. IoT application can be found in every industry with a diversity of implications for smart homes, travel and transportation, health and personal care, retail, agriculture, construction, etc. For e.g. in the Industrial Segment, the application of IoT revolves around automation and logistics. We will soon see IoT application creating smarter solutions by programmatically adjusting to the human behavior bringing more efficiency and convenience. As a direct result of IoT, businesses are awakening to a new era of the digital enterprise aspiring companies to find new ways of delivering their products and services. The future battlegrounds for most companies won’t lay within the products they produce or service they offer but instead in the software and automated service layers, those products and services would be wrapped in. As per the Ericsson Mobility Report, there are currently 4.6 billion connected devices excluding phones, tablets, and laptops which is expected to increase to 15.3 billion in the next 5 years. A recent study released by Gartner says that 43% of all companies are using or plan to implement an IoT application in 2016. Samsung SmartThings Hub is a successful example IoT solution. Not all smart home devices are single pieces of equipment and there are entire systems that you can use to automate your home. For example, the SmartThings system lets you control lights, locks, plugs, thermostats, cameras, and speakers from a central hub that you can access from your smartphone, as well as a wide range of sensors that you can use with the Smart things system to create a security solution that’s integrated with all of the other electronics in your home. There are still some barriers to adoption, however, for example, a battery life of devices and cost of devices. GSM and 4G networks are used more, more for IoT application and new advancements recently made in the network software, and device stack will greatly improve on these aspects. These are like sensors or devices. These sensors and devices collect information from the setting (e.g. associate degree air quality sensor) or perform actions within the setting (e.g. raising alarm). The hardware wants the way to transmit all that information to the cloud (e.g. causation air quality data) or wants the way to receive commands from the cloud (e.g. raise alarm). 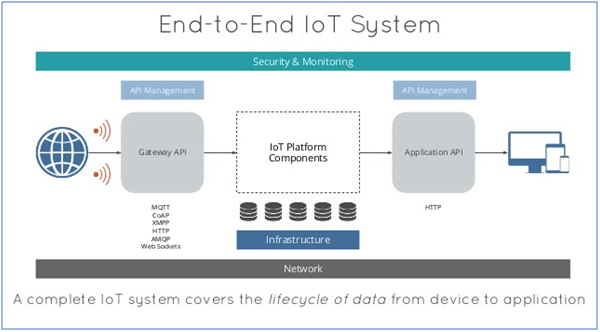 for a few IoT systems, there is an associate degree intermediate step between hardware and connecting to the cloud, as an entrance or router. This package is hosted within the cloud and is answerable for analyzing the info it’s grouping from the sensors and creating choices. To create all of the conveniences, there must be the way for users to act with the IoT system; e.g. an online app with a dashboard that shows air quality trends and permits users to require action. In order to facilitate communication, data flow, device management, and also the practicality of applications, the whole platform is termed an IoT platform. There are over three hundred IoT platforms as of last year and this variety continues to grow. The IoT platform market is growing at a compound annual rate of growth (CAGR) of thirty-third and is anticipated to achieve a $1.6 billion market size in 2021. 1. Connectivity & normalization: to make sure correct information streaming and interaction with all devices it brings completely different/completely different} protocols and different information formats into one “software” interface. 2. Device management: It ensures the connected “things” area unit operating properly, seamlessly running patches and updates for package and applications running on the device or edge gateways. 3. Database: ascendable storage of device information which handles data volume, variety and speed. 4. Processing & action management: Rule-based event-action and execution of “smart” actions supported specific sensing element information. 5. Analytics: Performs a spread of advanced analysis from basic information clump and deep machine learning to prognostic analytics extracting the foremost worth out of the IoT data-stream. 6. Visualization: permits humans to check patterns and observe trends from visualization dashboards wherever information is vividly pictured through the line, stacked, or pie charts, second – or perhaps 3D-models. 7. Additional tools: permit IoT developers model, check and market the IoT use case, making apps for visualizing, managing and dominant connected devices. 8. External interfaces: Integrate with 3rd-party systems and also the remainder of the broader IT-ecosystem via constitutional application programming interfaces (API), package development kits (SDK), and gateways. A smart city can benefit from the cloud-based deployment of its IoT systems and applications. A city is likely to deploy many IoT application, such as applications for smart energy management, smart water management, smart transport management, the urban mobility of the citizens and more. These applications comprise multiple sensors and devices, along with computational components. The International Data Corporation (IDC) has been monitoring IDC development and adoption and has stated that hosting providers will need to respond to the advent of IoT application with an increased infrastructure. As the number of devices grows and businesses leverage the new opportunities, hosting providers can plan now to deal with the influx of network traffic. For Digital Procurement particularly, IoT Application works as an enabler, empowering companies to gain visibility into the spend analysis and keep a vigilant eye on their consumers’ consumption pattern. The supply chain data generated is monitored continuously and analyzed for behavioral sets to make better-informed decisions. Having a proactive overview helps companies to estimate the demand and supply statistics, as they are aware of the needs and usage pattern of their consumers. This empowers them to negotiate with the supplier side in a more streamlined manner as they know in advance what material and what quality and quantity are required. All these factors combined contributes to cost savings and brings value to the procurement function. Another area where Procurement can benefit significantly is in the tracking and monitoring of the movement of goods within supply chains. Deploying the right set of sensors, which are tracked remotely with an IoT- enabled device can identify equipment faults, stoppages and leakages in real time allowing service and maintenance teams to respond to issues more promptly and accurately. This also ensures diagnostic data is obtained in order to deploy the right set of technicians. These factors directly impact the maintenance costs incurred by a company, contributing positively to the overall cost savings. AravindSekar. (2018). “5 Best Examples of IoT Applications In The Real World” https://analyticstraining.com/5-best-examples-iot-applications-real-world, accessed 15/03/2019. Ginna Koo, GDSCM. (2017). “Digital Procurement for Effective Supply Chain Management”. Retrieved from https://sipmm.edu.sg/digital-procurement-for-effective-supply-chain-management, accessed 15/03/2019. Gordon Murray. (2017). “Procurement needs a digital strategy”. Retrieved from https://www.slideshare.net/mobile/DrGordonMurray/digital-procurement-strategy05131, accessed 15/03/2019. Mxmendix. (2019). “Examples of IoT Applications”. 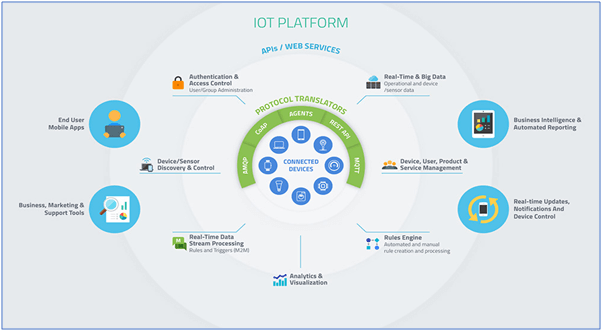 Retrieved from https://www.mendix.com/examples-of-iot-applications, accessed 15/03/2019. Tim Owen S. Yoro, ADPSM. (2018). “How Digital Procurement Transforms the Way Companies Purchase Energy”. Retrieved from SIPMM: https://sipmm.edu.sg/how-digital-procurement-transforms-way-companies-purchase-energy, accessed 15/03/2019. About the Author: Wong Kok Fu has substantive years of experiences in the field of procurement and supply management, specifically in the electronics sector. He is a member of the Singapore Institute of Purchasing and Materials Management (SIPMM). Kok Fu holds the Diploma in Procurement and Supply Management from SIPMM. He completed a leadership course, the Advanced Diploma in Procurement and Supply Management (ADPSM), in April 2019 at SIPMM Institute.